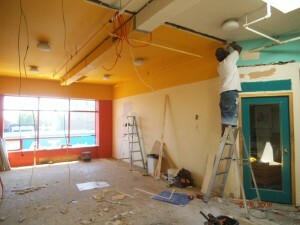 Our renovation is underway, and what a difference we are seeing already! After months of listening, discussion, and testing ideas we have a fresh understanding of how our space can express Shambhala society and nurture our community. Now we are physically creating the space—the frame within which we can deepen our connection with each other. And the desire for society is very evident— so many people are working together to make this happen. We had a long list of volunteers and Sangye began calling everyone who expressed interest. First we had to clear the space. Last week Eva, Rebecca, and Janet began wrapping and storing the photographs, calligraphies, paintings, and banners; Jen helped reorganize the outer office; and Pat, Maureen, Lindor, and Joe emptied the coat and supply closets and moved furniture. Ian and Fred took the sofas away. On Monday, Sangye, Angus, Chris Luginbuhl, and Joe got down and dirty. The yellow doors came off the community room, the tokonoma was removed, and the wall separating the entrance area and community room came down except for the steel studs. The wall trim and pipe/duct valances came off. The blue carpet came up, the coat closet made ready for new double-tiered coat rails and shoe racks, and space heaters were removed. The debris was piled high by the end of the day. Knowing that sangha members had built all this 27 years ago made it all particularly poignant. We joked that some day what we are doing will also be dismantled. The Sacred Space Working Group reviewed the layout and furniture samples provided by interior designer David Roches. Late last week we settled on the colour palette for the walls (Benjamin Moore Papaya), ceiling, and trim (Benjamin Moore – Mayonnaise), and selected the flooring (Spalted Maple laminate). On Monday evening Simone, a member of the Sacred Space Working Group, came through the door and just stopped, taking in the light, the sky, the space. A big Wow. After several weeks of visiting a wide variety of furniture stores and with ideas from our interior designer we have decided on most of the furniture.The first two pieces, long benches for which new cushions will be made, will be delivered today. Lindon Smith, our contractor arrived on Tuesday. 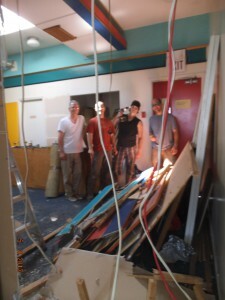 By the end of the day the wall was completely gone, the debris had been cleared thanks to Jacob Free and Chris Luginbuhl, and 43 boxes of flooring were piled high. Luckily we were able to use the freight elevator which provided access between the ground and second floor. On Wednesday, Lindon began to sort out the wiring, install electrical boxes for additional lights in the hallways, and open up what was the storage cupboard so it can hold the book store shelving and storage. Today, Friday, the floor has been laid and looks gorgeous. Lindon at the beginning of the week. In the coming days the walls will be repaired and prepped for painting, a new storage closet will be built in the back of the coat room, new coat and shoe storage will be installed, cabinets and shelving for the bookstore built into the former storage cupboard. Simone and Fred are designing a new lighter, moveable tokonoma. Fabrics will be selected and more furniture ordered. Then there is painting, which may begin tomorrow! 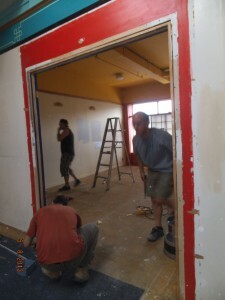 Chris Luginbuhl is the Painting Crew Chief and Sangye is the Volunteer Coordinator, who can be reached by email. You too can be part of writing this new chapter in our centre’s history. And more good news—we are on schedule and under budget. Stay posted for fresh news and pictures. Check the website for when we reopen. And red circle Saturday, September 21, Harvest of Peace, our ribboncutting celebration day.